So proud of my son Kyle and a fellow 8th grader Kaiya for spending more than 15 hours going through the IBM Design Thinking process to develop a mobile app design to compete in the Notah Begay III Foundation National Youth App Contest. The goal of the contest was to get native youth (grades 8 to 12) to design a mobile app to combat obesity and type 2 diabetes among native american youth through exercise and diet. One key to getting native youth hooked into mobile technology design and development is to show them the various tasks related to hardware and software design. They had fun learning user centered design and creating content for the contest which was due on 10/31/2018. Here are a couple images from their submission and a link to their NB3F mobile app design document. Also I was very happy FatPipe Rio Rancho opened up in September 2018, this company provided a nice meeting space (in between all the sports and other student activities which forced us to meet in the evenings and weekends) to collaborate and get through the design process. Thanks FatPipe Rio Rancho! This last weekend (Saturday 2/25), I held my first Introduction to the Raspberry Pi Hands on Workshop at the Loma Colorado Public Library in Rio Rancho, New Mexico. I had a total of 8 attendees (full house) ranging from youth to adults that wanted to know more about this inexpensive computer. Feedback was great and it ranged from having a great experience with a new educational computer to interest in physical compute (using the GPIO pins) and more advanced topics. Don’t forget, if you want to sign up for a workshop, you need to use the Loma Colorado Calendar of Events page. I also want to thank the City of Rio Rancho and the Loma Colorado Public Library staff, the facility is a great place to teach about technology, the support was awesome to make this event happen, and the internet access speeds are some of the best in the state! After some back and forth with the local library, I will now be teaching some free Raspberry Pi computer classes at the Loma Colorado Public Library in Rio Rancho, NM starting at the end of February 2017 (#RaspberryPiNM). Space is limited because this is a hands on event, so keep a eye out for the signup links on the Rio Rancho Public Libraries Calendar of Events page. Ok, the Raspberry Pi 3 just keeps getting better … especially for kids. One of the latest updates along with the PIXEL user interface is the new update that added the Chromium browser AND an Adobe Flash Player plugin! 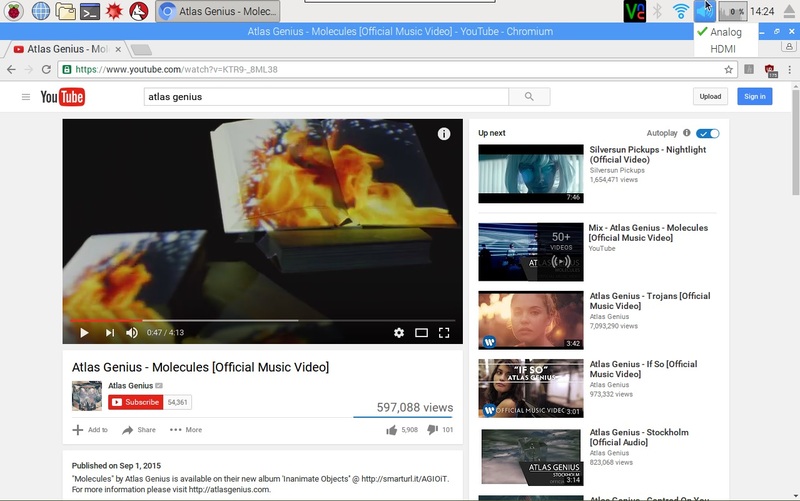 This is better than using Iceweasel which was changed to Firefox recently. The resulting change drives the processor to a bit above 50% when playing videos, but the bang you get out of these new features is awesome. Also notice you can easily switch from HDMI or Analog Audio output with the right mouse click on the speaker icon in the system tray. 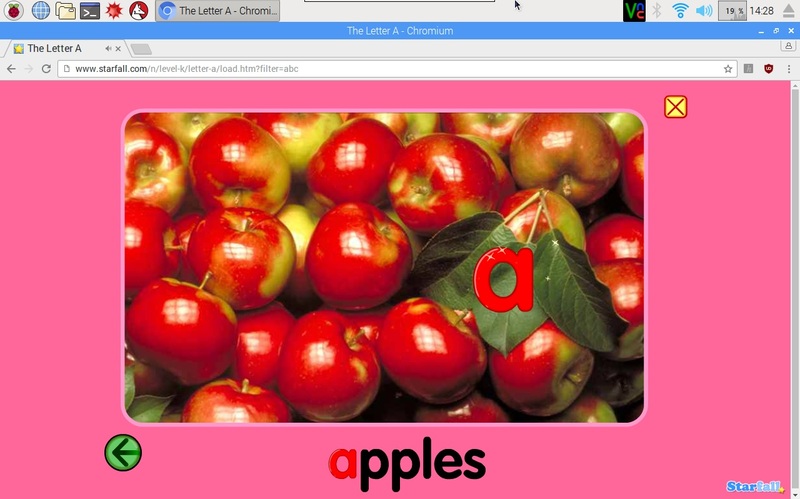 I tried out the new combinations with YouTube and Starfall (my kids loved this site growing up). If you want the flash components to automatically start you need to check this box on the browser plugins setting page, otherwise you have to right mouse click on the flash puzzle icon and say run every time flash is used. Starfall.com interface below … I’m thinking about how our local Montessori school can use some Raspberry Pi 3 computers to start teaching keyboarding and mousing skills earlier since almost all standardized school testing requires computer proficiency now. I’ve owned a Marantz PMD661 for a while now and I was quite bummed to find I could not use any of my SanDisk 8GB SDHC Class 4 cards at the time (about a year ago). I tried many things at the time, I formatted the SDHC Card in the Marantz PMD661, which worked, but when I went to record audio, I would get a “Err Card 2” message when I tried to record (or it would error on booting the recorder). The only solution, buy more 2GB SD Cards to use. Lately I have seen less and less of them in the stores, so I also recently did a last time buy of about 5 of them figuring that many would allow me to use my recorder for years to come (yes, these flash storage devices do wear out). Well, it looks like Marantz/D&M Professional finally fixed the SDHC issue for most of the cards out there. On 6/17/2011 they released a new firmware version (A2.03), the last update I had seen on the website was A1.17. The firmware update was mostly to address the use of larger capacity SDHC cards. I installed the new firmware per their instructions (used a 2GB card) and now I can successfully record audio using the SanDisk 8GB SDHC Class 4 cards I’ve had for a while now. With the 2GB cards, I could record a little over 3 hours of 2 channel audio (cd quality – PCM-16bit, Stereo, 44.1 khz), with the new 8GB cards I can now record over 12.5 hours of audio as seen on this picture to the right (not sure I’ll ever need that much recording time). Thanks Marantz/D&M Pro for the update! I’ve written about my Eagle Creek Tarmac ES 22 before, talking about the handle screws coming loose. Now I want to talk a little bit about another thing I’ve discovered about the bag I love to travel with. One thing I’ve noticed is that the wheels don’t quite track in the same direction with the bag. Each of the wheels (if looking from the wheel side) point out which causes some uneven wear on the wheels as you can see in the picture below. Notice the lighter color on the wheel which indicates this is the part that makes contact with the ground. Because of this, I’ve taken a bit of proactive maintenance on my Tarmac 22 bag. Since I live in dry and dusty part of the United States, every so often, I take the wheels off to clean and lubricate them. I also note which side of the wheel was on the inside so I can flip the wheel to wear on the other side. Removing the wheel involves using a set of pliers and a 5mm allen wrench to unbolt the wheel (you also have to unzip the bag liner). The wheel is held in place by a bolt and a lock nut (nut with a plastic part to keep it from accidentally coming loose). I use the pliers to grip the nut since it’s a tight fit. Once the wheels are off and marked, I clean them with a penetrating lubricant like WD-40. This clears out any dirt and dust and helps the ball bearings to move freely again. You will typically find all kinds of dirt and hair on the wheels when you remove them. Pictured below is a dirty wheel and one that has been cleaned. Also don’t forget to clean out the wheel well too (pictured above without a wheel). When all the cleaning is finished, just reverse the procedure to install the wheels. Remember to flip the wheels so they start wearing on the other half of the wheel. With a little bit of preventative maintenance you can make the wheels on your Tarmac 22 last as long as possible. If the bearings ever wear out, I’m sure Eagle Creek will gladly replace the wheels since there is a lifetime guarantee on the bag.